Carlin Motorsport had a great result in the second qualifying session with three of their five cars finishing in the top three. Charlie Kimball set a new lap record of 1:06.848 (the previous lap record was held by Takuma Sato from 2001 with a time of 1:07.028), which saw him snatching up pole position for race two. He was closely followed by his team-mates Alvaro Parente, whose best lap was a 1:07.383, and Christian Bakkerud, who finished in third place with a time of 1:07.419. Barton Mawer from T-Sport secured pole position in the National Class with a time of 1:08.354. 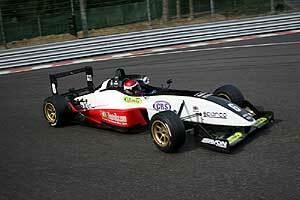 Promatecmes Charlie Hollings finished in second position, setting a time of 1:08.693. Jonathan Kennard from Alan Docking Racing set the third quickest time of 1:08.927.